I began my career in the fly fishing world at a young age. I first picked up a fly rod around age 10, started tying flies at 14, and I was a commercial fly tier at 16. I then chose my college based on the fishing surrounding Gunnison, Colorado and began working as a full time guide while working on my bachelor's degree. Fast forward to 2019 and I now bring over 18 years of industry experience to the table, gained while working for some of the industries top outfitters in Colorado, Alaska, Washington, Argentina, Chile, and New Zealand. After 10 years of being based in Gunnison, Colorado I relocated to the anadromous fish mecca that is Seattle, Washington. After just under 4 years of obsessive fishing and guiding all over Washington State I've relocated to Bozeman, Montana where I'm now pursuing a slightly different direction in life. My time in the Northwest was an incredibly educational time in my angling career. Trout fishing in the Northwest was very different than I was used to in Colorado, it was similar to the angling I experienced while guiding in Southern Chile. However, my real fishing obsession in the Northwest was steelhead fishing. I've always prided myself on being a well rounded angler. I made it a point to learn as much as I could about steelhead in the years that I lived in Seattle. Of course my preference is catching a steelhead on a swung fly, be it a summer run on a full-floating long-belly line, or a winter fish on a short, heavy Skagit line. However, not wanting to be so limited by the swung fly I also greatly enjoyed the anticipation of fishing a float and jig, and I have no qualms with gear fishing or nymphing. I find it ridiculous to make a judgement call on someone's recreational activity as long as the resource and fish they catch are treated with respect. 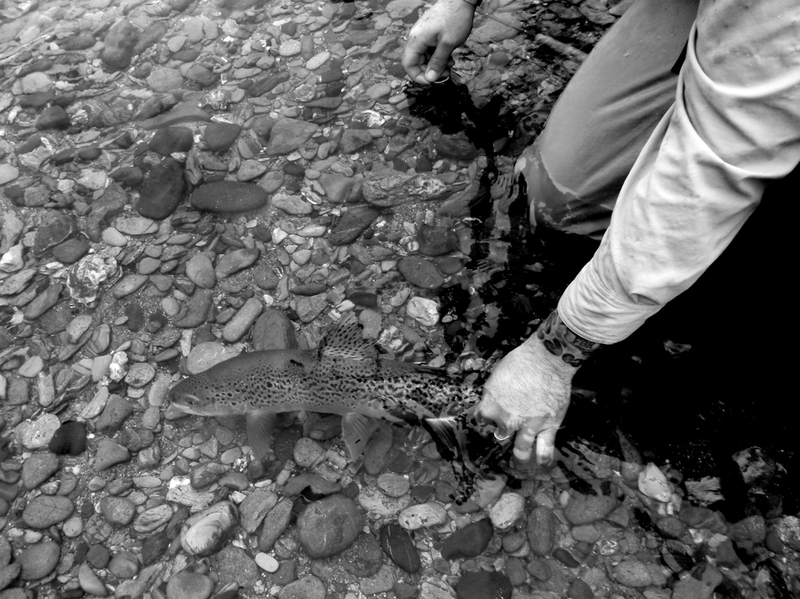 For me, fly fishing has always been about having fun while in the outdoors. Whether you're an expert or have never touched a fly rod, I consider a day to be successful when we can have a good time on the water. Whether it's catching some fish, learning a thing or two, or just enjoying being the escape of being outside, these are all things that can make a day a success in my eyes. I've built my reputation around integrity. A trait sometimes lost in the fly fishing world. I've always let my guiding do the talking. I worked hard to get my anglers into fish while providing a pleasant, educational, day. I would never take someone's money and show them a bad time based on unrealistic expectations, a slick website, or a "fake it until you make it" strategy like some outfitters. I believe honesty and integrity have earned me my large client base and my solid reputation. Besides guiding for a living I've taught a great deal of fly fishing and fly tying classes. I take great pleasure in seeing people with a genuine interest in the sport make progress and learn new things. One thing that I think is so great about fly fishing is that I continue to learn nearly every time I get out. The lifelong learning curve that fly fishing provides keeps me interested and coming back day after day! Please visit my speaking engagements page to learn a bit more about my tying classes and demos that I continue to do, as I retired from guiding in 2014.